<strong>Pooch plethora:</strong> Dogs like these at the Santa Barbara County Animal Shelter in Goleta have been overrunning the capacity of the shelter, causing the county to consider a spay/neuter ordinance. It isn’t often the Board of Supervisors sees their meeting room filled for an item on their agenda. But the words “spay” and “neuter” on the agenda have always provided plenty of spark, and this time was no exception. County residents are split on the potential of a new ordinance regulating the removal of the reproductive organs of cats and dogs-referred to as spaying of females and neutering of males. After nine months of meeting, listening, and learning, an 11-member task force has returned with a “be a responsible owner” law, as termed by task force chairman Dr. Ron Faoro. Under the proposed ordinance, pet lovers may own an intact cat or dog with a veterinary certificate to purchase an unaltered-animal license. Owners without the certificate must spay or neuter their cat or dog. Pet owners who are convicted for crimes against animals or domestic violence, possess an animal that has been impounded or cited at large three times in a year, or have been found guilty of allowing a dog to run free resulting in injury to another animal or human would not be eligible for the license. The ordinance concept comes at a time when Santa Barbara County shelters are facing increasing numbers of unwanted or lost animals. Michele Mickiewicz, interim Public Health Department director, said that despite expanding shelter spaces, adding more staff, and benefiting from the assistance of additional volunteer programs, the number of animals has continued to grow beyond capacity. 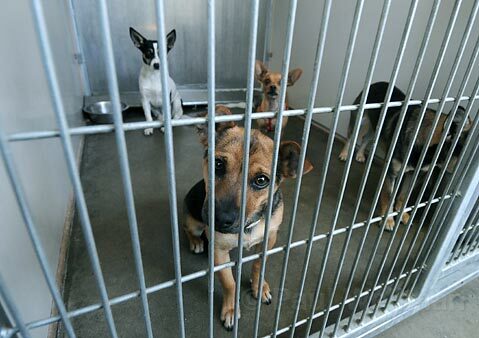 The Santa Maria Animal Center, for instance, has a daily capacity for 124 dogs and 150 cats. On any given day, the number of cats is more like 190, while dogs are up to 150. The number of dogs that county animal shelters take in has gone up 16 percent-or 644 more dogs-from five years ago, while the number of cats has gone up 17 percent. In the past year, 24 percent of dogs that passed through Santa Barbara County shelters had to be euthanized, while 38 percent were adopted and 38 percent were reunited with their owners. The goal of the ordinance is to not only decrease the number of animals in shelters, Mickiewicz said, but also to raise awareness of the responsibilities that come with pet ownership. The decision to recommend the ordinance to the supervisors was not without controversy, as the task force voted 6-5 to move forward with the concept. “Everyone probably knows we were a divided task force,” Faoro explained. Those for the concept represented 75 combined years of working on animal welfare issues and at shelters, he said, while those against the concept, although enthusiastic, “do not have any experience working in the shelters.” Many supporters said the ordinance would be a new tool to combat the problem. “It encourages those who are irresponsible to be responsible,” said veterinarian Dr. Scott Smith. Some opponents called the task force flawed and biased, while others reiterated there was no evidence that mandatory spay/neuter laws have been generally successful in reducing the shelter population in other jurisdictions where ordinances existed. Because of the public interest, the supervisors are holding a second hearing on the issue on November 10 in Santa Maria, where the supervisors will likely make a decision on the issue.